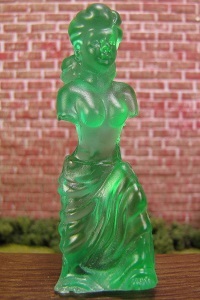 The Gummi Venus de Milo comes from The Simpsons. 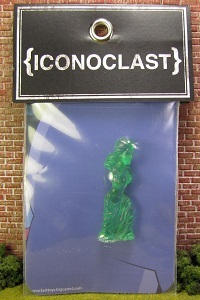 The figure was created by Iconoclast Toys. Originally the figure was larger, but the recent release is a much smaller minifigure. 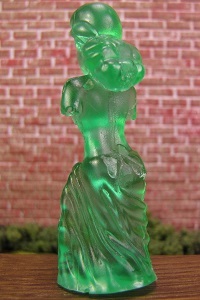 The figure is cast in a translucent, green resin. 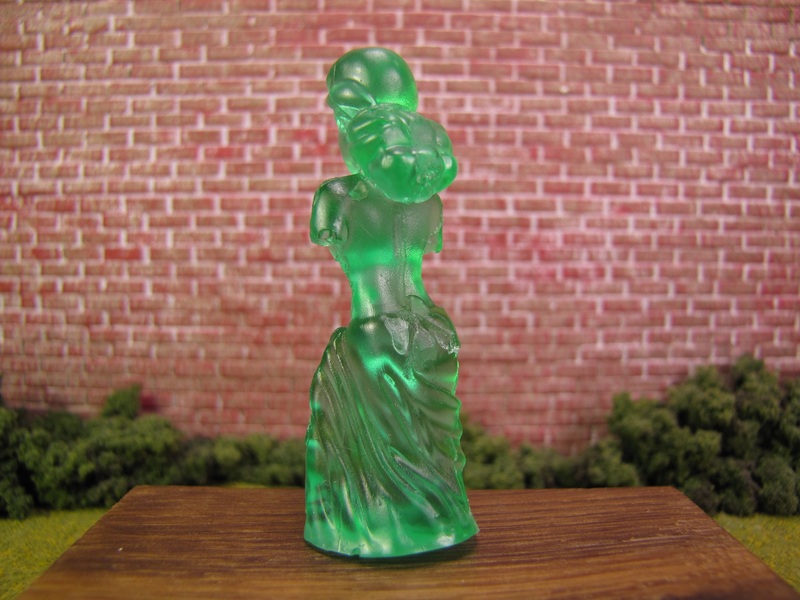 The packaging has two images for staging the Gummi Venus de Milo. The pillow, where the gummy is seen for the first time, and the baby sitter’s jeans. The figure was purchased for $13. 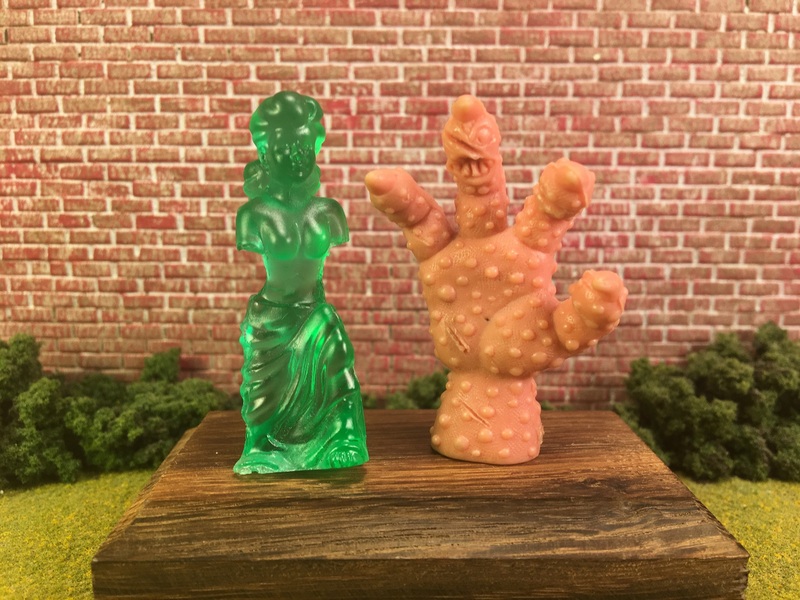 As of writing, the figure is still available for sale. The accuracy of this sculpt to the figure that is seen in The Simpsons is amazing. 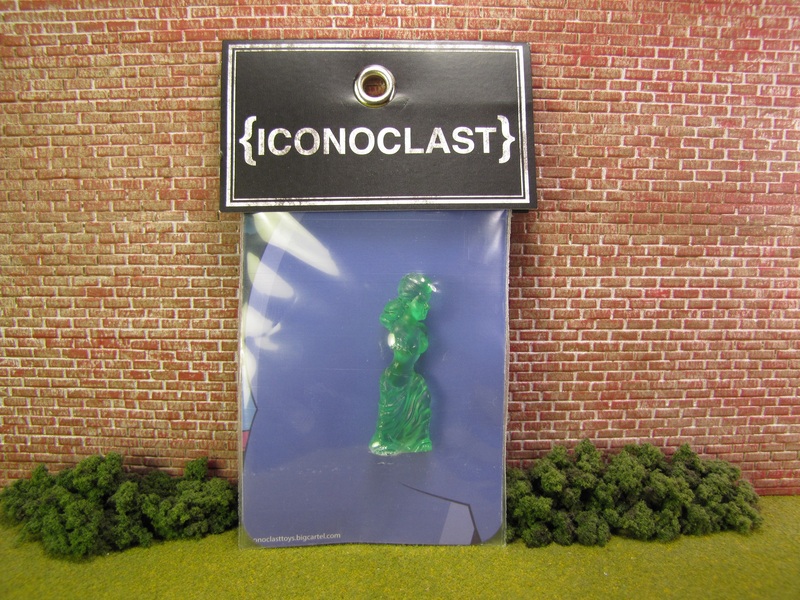 The color isn’t a perfect match to the cartoon, but the translucent green really gives it a gummi appearance. I liked this figure when I first saw it, but it is even better in-person. I was genuinely surprised at how much I like the figure. 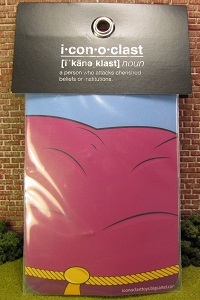 Part of me wishes I had left it packaged because it looked so nice in the package. The packaging isn’t designed to reseal; once it’s opened it stays opened. 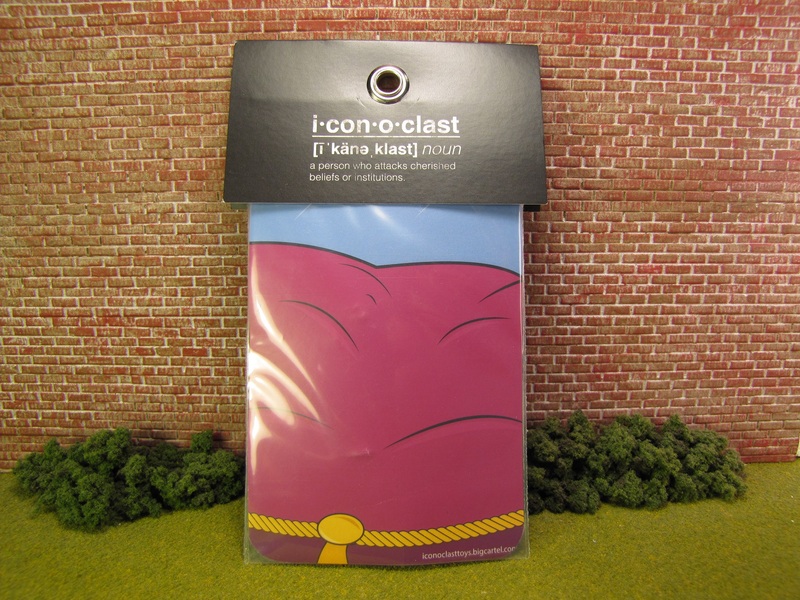 My only complaint about the figure is that the bottom isn’t perfectly flat. It took a little bit of effort to make sure the figure stood up. You can notice it if you look at the “feet” of the figure. It kind of looks titled upwards. 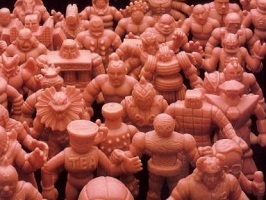 With so many artists able to recreate a M.U.S.C.L.E.-like plastic I am sometimes frustrated with resin figures. Not this time. The figure is too charming. 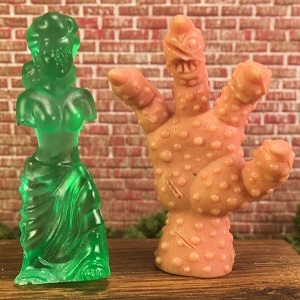 Although, if this figure was cast in a more flexible rubber (giving it a gummi-like texture) would have been mind blowing. I would suggest any minifigure, or Simpsons fans, buy this gummi figure ASAP. 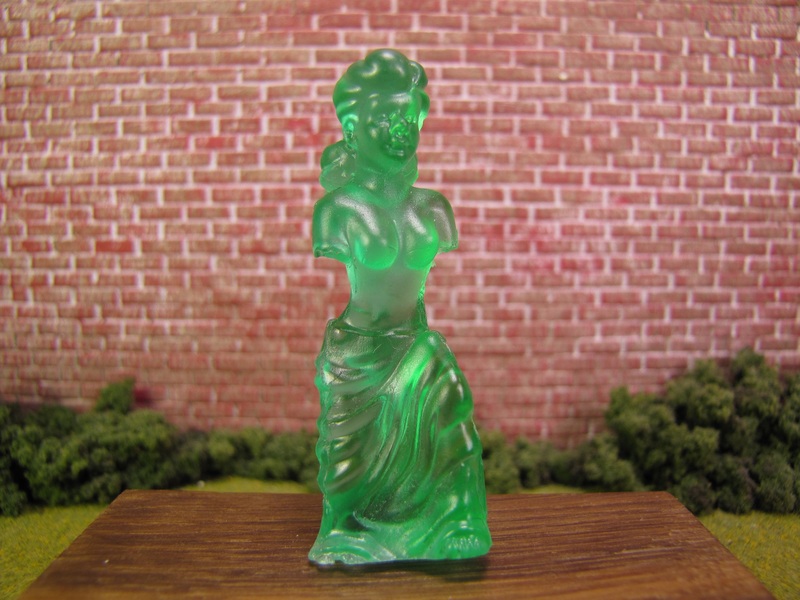 It is a great gummi sculpt and makes you smile every time you look at the Gummi Venus de Milo. I will stop saying gummi so much. This entry was posted on Thursday, July 19th, 2018 and is filed under Art, UofM News. You can follow any responses to this entry through RSS 2.0. You can skip to the end and leave a response. Pinging is currently not allowed.